Tech-enthusiasts of the 1920s were obsessed with turning everything electric. They wanted electric mixing bowls, electric dishwashers, and even electric haircuts. 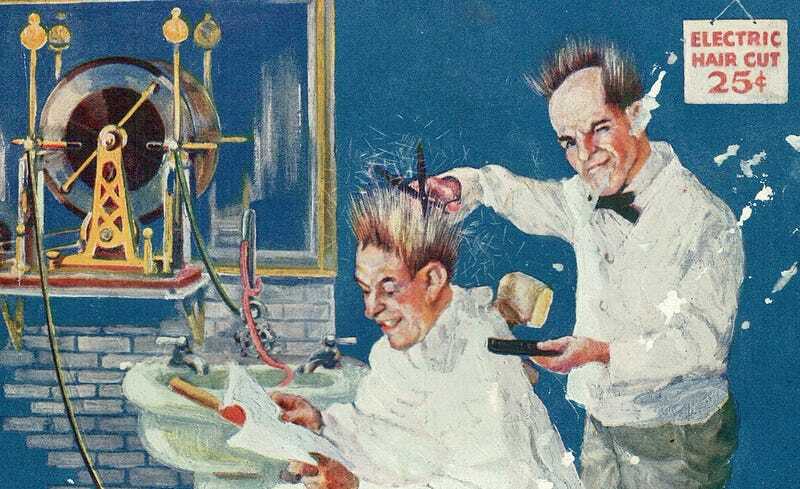 It may seem like an obvious idea today, but back in the 1920s, an electric haircut was straight out of science fiction. The cover of the August 1923 issue of Practical Electrics magazine included the barber of the future, complete with his electric scissors. It was still an incredibly new idea to use electricity in the barber’s chair. But by the mid-1920s early adopters were figuring out how to apply electricity to personal grooming. The cover of Practical Electric proclaimed, “WHY NOT?” while a barber of tomorrow and his electric clientele both see their hair stand on end. For Americans, the 1920s was the decade that turned the country electric. Only about 35 percent of Americans had electricity in their home in 1920. By the end of the decade almost 70 percent of American homes had electricity. Whether it was that newfangled radio technology or a barber’s clippers, electricity stormed into American life during the Roaring Twenties. And while we often think that technology adoption is fast today, it’s helpful to remember that other generations went through their own periods of rapid growth. The smartphone has sure changed lives here in the 21st century, but it’s nothing compared with how electricity changed America in the 1920s.